It’s timeless, it’s essential, and it’s quintessential red meat. And there’s a good reason these people field so many questions: Just look at the chart below – there’s so many different cuts of beef. What’s the difference between flank steak and skirt steak? Or shoulder steak and tri-tip steak? What is tri-tip steak, anyway? Once you get the steak home, you’re faced with a myriad of other challenges: Do I marinate the steak? Slow cook it? Grill? Pan fry? What is a medium rare temperature?!?!?!?! That’s why we created this website – to become a “one-stop” resource for these and other red meat related cooking questions. It will take some time to upload all the information but, over time, we aim to provide information about every cut of beef listed below – its attributes, best use(s), recipes, and anything else that suits our fancy. 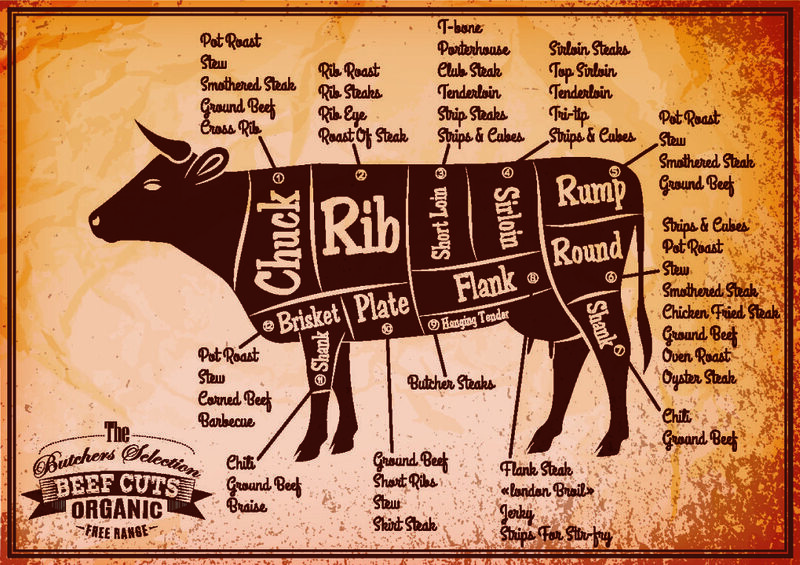 We’ve included a beef chart below and will be adding information about all the different cuts.